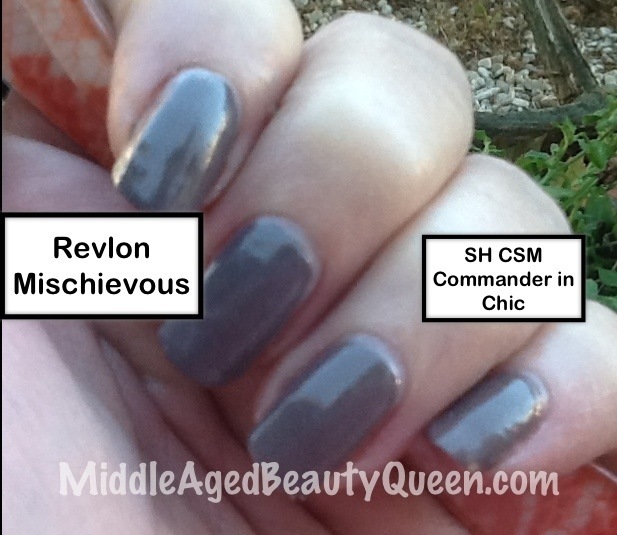 This really isn’t a SMACKDOWN but more of a comparison of Revlon’s Mischievous and Sally Hansen’s CSM Commander in Chic. Holding 2 bottles is hard especially when I want you to see the nails, not the bottles. So I though this would be easier. I manicured my hands with both polishes using my half and half method that I still say I invented, but as you can see there is virtually no difference between the 2. 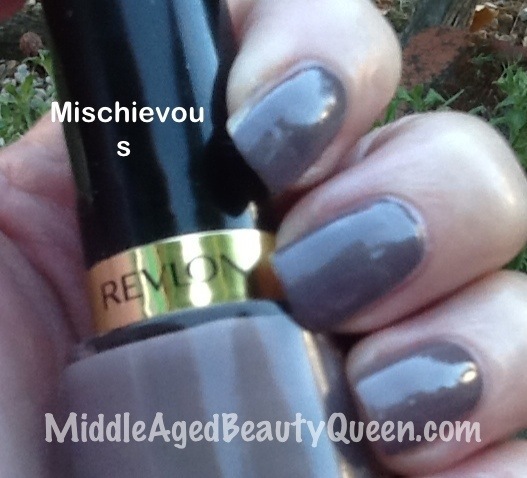 Revlon Mischievous has been around a long time. Mischievous was released in 2007. It may be the original Commander in Chic Color released by Revlon. I could not find a release date for CiC but the earliest review I found was 2011 so I’m assuming it was released in either late 2010 or early. 2011. I’m sure there are more out there but these are the ones I own and know to be dupes for Michievous and Commander in Chic. Commander in Chic has the wide flat brush that I like so well because it fits my nail bed perfectly. I know some of you aren’t fans of the wide brush but if you dip the brush in the bottle then wipe on 4 sides you will get a regular size brush that works the same as the Revlon brush. I do like the wide flat brush, it makes polishing my nails go faster and again dry time was great with the CiC. I’m trying not to use quick dry top coats and I did not use a quick dry top coat on this one, either brand. I don’t know if its just me but it seems like when I use a top coat the nail polish will wrinkle. If I don’t use a top coat I don’t have that problem. Any one else having that issue? Let me know, if for no other reason then to let me know I’m not alone in that. These were the first pictures I took of these 2 polishes so now you can see why I took them out. But they do show that the pointer and middle finger are wearing the Revlon Mischievous and the ring finger and pinky are wearing Sally Hansen’s CiC. Hopefully that makes sense to you. I’ve had my nails painted this way for a couple of days now and not one person has made a comment about 2 different colored nails, which usually always happens when I use more contrasting colors. As you all know Commander in Chic is my favorite polish of them all and thanks to my friend Coco I now have a life time supply of CiC. Thanks again Coco, you little nut! 💅 As always, thanks for stopping by! E-bates.com is Money in the Bank! If you're like me, you shop online more often than not. You need to be using ebates.com because they give you a percentage of your purchase amount BACK TO YOU. Please use this link: x-apple-msg-load://34551FF7-8289-409B-9D58-885154AB7BAF/ Which will take you to ebates, ten you pick your store and will be directed to their site. Each store has a cash back percentage, some more, some less. In 2015 my cash back amount was $138. I didn't do a lot of shopping because of, well you know. Try it, and please use my link because yes I do get a part of that back. I promise it will all go back into my blog to purchase nail polish lipstick and other items to review for you. Trust me, you have nothing to lose. I know I was very skeptical but now I just have to remember to go to ebates.com first! Let me know what you think. Nail Polish of the Month!